Powerful stories often follow a narrative of conflict. There is man versus man, man versus God or Nature, and ultimately, the most challenging and compelling stories feature man versus himself. The 2015 edition of Ironman Coeur d’Alene offered all three. Ascribing myself the protagonist role, it is fair to say that I came out with the short end of the stick in the first two conflicts. Others in the field handled the day much better than I did. Many bested my results. My efforts to anticipate, address and respond to the 105 degree heat were inadequate. Enough so that after vomiting four times on the second half of the run I finally finished and promptly found myself in the medical tent for 80 minutes. But when the demons came out, long after the body was weakened, I continued the mental fight. I’m not sure if it was mind over matter but the mind certainly mattered. After a certain point, the disappointment fades, the pain dulls, and the other competitors become scenery. The only question becomes “How do I keep myself moving forward?” Everything else is stripped away and the essence of a mental battle is laid bare in just a handful of words. Despite an unexpectedly poor bike segment, all was not lost until the run. I had hopes of running as fast as a 3:40 — it actually took an additional 90 minutes. I began the day ready mentally, and I believe physically, to compete. I arrived with a goal to continuously put myself into the top ten of my age-group until such time that I could no longer. I wasn’t sure if the moment would come or if it would come early on the bike or midway through the run. The stage was set for a battle of man versus man — I would take all comers, refusing any quarter and following my plan with discipline. 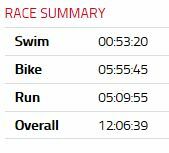 I had set a goal to swim with the lead pack but was prepared to let them go if I felt my heart rate climbing too high, too early. I knew my nutrition plan — adjusted for the weather with fewer solids and more fluids and salts. I knew my goal watts for the first half of the ride, for the second half of the ride and for any hill that looked as if it might take more than three minutes to climb. I had practiced running in the heat by adjusting my speed and effort to keep my heart rate two beats per minute below where my body turns over into low anaerobic level. The swim ended as comedy. I started on the front row on the right corner of the rope line. At the sound of the cannon, I ran into the water, took several strokes and found myself sharing the lead with two others. We more or less occupied a space five meters across from the buoys to my position and stayed that way for approximately 600 meters. As we approached the first turn, I felt them accelerate. I could have gone. I was tempted to shoot into the corner because I could have taken a better line. But prudence ruled. It was disappointing but I let them ease up ahead of me and I started following the disturbed water behind them instead of the stand up paddleboards that were gently gliding ahead of the field. By the time we had turned and organized into a straight line again, I wasn’t swimming in third but was swimming in a field of about half a dozen people ally vying for position and following the leaders. It remained that way throughout the rest of the first loop. I came out of the water with a handful of men and two age-group women. At least four of us finished the second loop together as well. The comedy came at the conclusion of the swim. When we were only about 50 meters from the finish, a guy who had been swimming for half an hour on my left suddenly veered over and dunked me. It was not the sort of contact that one gets because everyone is jostling for position. It was what must have been the culmination of his frustration. Immediately prior to the episode I had been swimming straight toward the exit arch and he had slid over to the right three times and bumped me. He was like a dolphin trying to inch me over to the side. He thought the line to the beach was about 5-10 degrees further right than it actually was and each time our arms tangled. Each time we kept swimming and he would surge just a bit to try to get far enough ahead to turn his line to the right. Eventually he swam up and put his whole right arm over my head and forced it down. I was so shocked I stopped swimming for a moment. My first instinct was to give chase and retaliate with a yank on his feet but instead I got myself moving, got immediately behind him and laughed. This guy was way too intense for his own good. I vowed to take him on the bike. Approximately two and a half hours into the day I started to notice things were off. 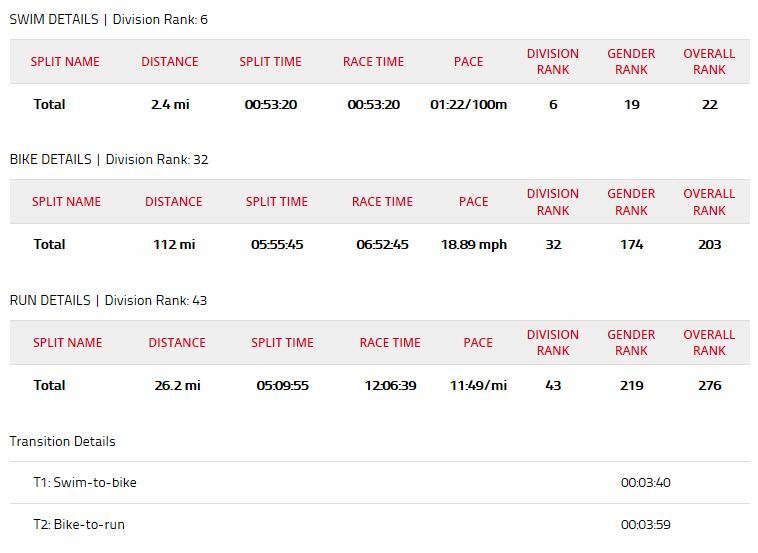 By the time I was halfway through the bike I knew I was no longer at the front of the field and was slipping backward within my age group. In the conflict of man versus man, I was coming up short. I’m not sure that you ever “win” by challenging nature. The best outcomes are found when you can adapt and find a balance that allows you to absorb what comes your way. The day after the race, the heat index on Interstate 90 where most of the bike course snakes up and out of Coeur d’Alene to a turnaround point was reported at 140 degrees. Water was important but no amount of water was going to cool a body off. When I noticed the wind picking up late in the morning as I made my way back on the last 20 miles of the course, it was a hot wind and made me think of a pizza oven. I could feel the heat radiating off of the road up through the face shield on my helmet. Yet it was beautiful. All along the course were ranches long rolling hills with mountains on the horizon. Even as we made our way through a low pass — presumably putting a mountain behind us — mountains remained on the horizon all the time. I took salt pills just like I had practiced. I pedaled downhill. I rode within myself and yet for more than 45 miles I saw my normalized power first slide down some 15 to 20 percent below my targets and then hover ominously before I started taking shortcuts like sitting up early on the climbs and coasting down parts of the descents. Nature was beating me down and I knew it. I had not thrown in the towel on the race but knew I was falling out of contention. I redoubled my mental effort to make sure I would not miss any of my nutrition because I had stopped paying attention. In hindsight, I think I came off the bike in fairly good shape. Perhaps a little worse for wear but I had ridden at least two hours well below my training levels so even if it was hot, my legs were a bit “rested” compared to what I had prepared them to do. Sitting in the changing tent as I slid on my shoes, first one and then the other hamstring cramped up. I would have fallen out of the chair had it not been for a kindly volunteer who suggested that I “rub that charlyhorse real good” before standing. In addition to advice, he supported my whole left side by putting his hand on my arm to balance me back onto the chair. Someone handed me an ice-cold towel that I draped over my head and neck and held in place with my visor. With that, I hobbled out of the transition convinced that within 15 minutes, a little running would work out the kinks. I wasn’t leading, but I was still in the race and ready to go. At this point, I was no longer in control of my destiny. I was counting on at least some of the people who had passed me on the bike to blow up on the run. In the conflict with the elements, it was a genuine drama. I saw evidence everywhere, and ignored it, that the drama would likely turn tragic. There were people sitting in the aid stations. Ambulances and golf carts littered the course. Before I turned the corner to come into the first aid station as I passed through mile 11 or 12, I watched a woman hold onto a mailbox and vomit Gatorade all over the road. Several professionals were walking. Almost immediately I found it difficult to talk in the aid stations. I couldn’t ask for what I wanted and resorted to nodding and pointing. After peeing on the bike course around the 75 mile mark, I didn’t have to go again until mile 17 of the run course. Despite my slow pace, I continued optimistically and with an eye on my heart rate. At mile 14, while still in the aid station, I vomited into a garbage can. It was an old-fashioned power-puke the likes of which I have not performed since college. At this point irony enters the story. Everyone around me could see what was happening, but I was oblivious. I’ll be fine, I thought. Just need to get going and it will sort itself out by the next aid station, I told myself. That was the bad stuff, that wasn’t absorbing now I’ll replace it with easier to digest fluids, I dissembled. I was in a spiral and the only question was whether or not I would make it another dozen miles before I was totally wrecked. At this point, the walking began in earnest. I was repeatedly dizzy anytime my heart rate went over 120 or 125. I vomited three more times before the finish including on mile 25 when I fell down and stood up facing the wrong direction. Thankfully other competitors were walking by and oriented me toward the library parking lot that served as a gateway to the final chute down Sherman Street. In the contest between man and nature, nature won handily. Before it was all over, my performance had sunk past comedy, rocketed through tragedy and settled on farce. My body was not in revolt so much as shutdown. The swim and the bike had brought my systems to a subsistence level of operation. As long as I didn’t overdo things, I would be able to ingest and absorb just enough to keep going. The double cramps in the changing tent were evidence of how thin the line was between performance and packing it in. The vomiting depleted all reserves and from that point I couldn’t absorb electrolytes or sugars fast enough to compensate for my metabolism in the heat, let alone for any sort of running. I played games to keep focus. My watch kept a running tally of the pace of the current mile. I would walk until it got up to 15 minute miles and then run the pace down as far as I could. Several times I got it down to the 11 minute range before my vision narrowed or I had to puke again. When I discovered that the “dizzy zone” was a heart rate in the 120s, I’d go as far as I could to see if I could hit 126 without a problem, then 127, then, suddenly, I couldn’t. I held out affection for the mile markers like a starving man desperate for food. I was actually running and in control of everything when I came upon the 20 mile marker. I was so upset that I had somehow gone right past 19 without noticing it that I slowed to a walk, incredulous that I had missed 19 which I had so been looking forward to seeing. My emotions were all over the map — literally I was veering toward a dark mood because I had been looking forward to a sign and now wouldn’t see it. I had invested in that sign. I wanted to see the finish arch. Fears surfaced that I haven’t really addressed, ever. My mind was at once delicate — careening from this idea to that, losing focus and finding insight — and fearsomely devoted. I felt compelled to finish. No one I loved would care if I walked off the course. But I cared. It mattered to me. I didn’t want to fail in what I had started. I wanted to be an example of perseverance for my children. I had trained for seven months to race, to compete, by God I was at least going to finish upright. In the biggest battle of the day, I dueled with myself. In that way, I was doomed to lose but through the effort and willingness to accept the darkest, most difficult elements eventually came out on top. I found that finish arch. In fact, I raced down the final eight blocks at a pace that I had not seen since the first mile of the marathon. Upon reaching the goal, I indulged in a smile — not of relief, rather it was a base joy — and summersaulted across the line. Next up — My body performed a virtual circus of weird behaviors. Details to follow in a future post. From tingling in my teeth and feet, to spasms and convulsions — I was a mess.